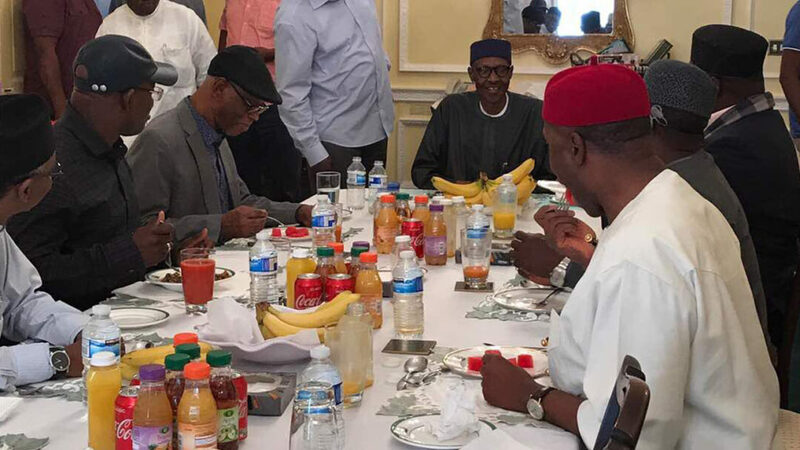 Nigeria’s ailing President Muhammadu Buhari on Sunday received a delegation of the All Progressives Congress leadership in London, the Nigerian presidency said in a Twitter message accompanied by a photo of the president with the party members. The photo was the president’s first image to be shared publicly since he left the country on May 7. The delegation hosted to lunch included APC’s national chairman John Odigie-Oyegun, Governors Rochas Okorocha (Imo), Nasir El-Rufai (Kaduna), Yahaya Bello (Kogi) and Tanko Al-Makura (Nasarawa), and Minister of Transportation, Chibuike Amaechi. The visit of the APC leaders to the president came two weeks after the country’s acting president Yemi Osinbajo’s. No details were given about the meeting but it is believed to be the first face-to-face encounter between Nigeria’s two most senior politicians in more than two months. Buhari has spent most of this year in London receiving treatment for an unspecified medical condition. He left for London for a medical check-up on May 7, leaving Vice President Yemi Osinbajo to lead the country. Buhari would only return to Nigeria “as soon as his doctors give the go-ahead,” the presidency insisted. He had earlier left Nigeria on January 19 for London to “undergo routine medical check-ups” during a short holiday. He only returned on March 10 after an extended period of medical treatment. If the Pictures and the stories are not true, what is the need/usefulness to the state of our Nation. What a deceitful leaders! may God save our Nation.